If you know a youngster who's ready to read short chapter books, and looking for something different, take a look at Ophelia Wild, Secret Spy. 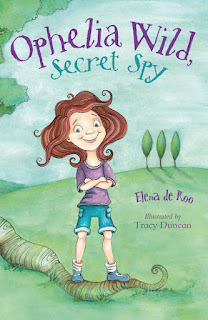 Written by Elena de Roo and illustrated by Tracy Duncan, it was published by Walker Books (2012). Feisty Ophelia Wild decides to set up her own detective agency, with its headquarters in her tree house. Along with her assistant, Albert, she foils bullies, solves a meat-pie mystery, and cracks the case of the disappearing dentures. It's not common to find a short chapter book written in verse. The rhyme makes predicting words easier, and the rollicking rhythm means Ophelia Wild, Secret Spy is as much fun to read aloud as it is to read to oneself. There's lots of white space that will help young readers, too. Duncan's illustrations will definitely add to children's enjoyment of the book. The cartoon-style line drawings have lots of interesting detail and unusual perspectives. My favourite picture was the one of Ophelia herself, trying on a toupee and dentures as a disguise. Although Ophelia is a girl, this isn't a girly book. Her assistant, Albert, plays a lead role too, making this fun mystery story perfect for both girls and boys. Be sure to visit the Walker Books page for Ophelia Wild, Secret Spy, where you can download fun activity sheets. @Green Mama Yes, tragic is definitely not a descriptor for this Ophelia!